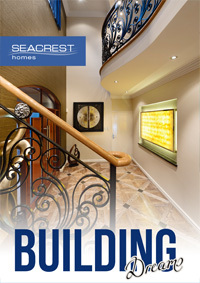 Based in Perth, Seacrest Homes is a family-home builder with a service that is second to none. The Seacrest family is made up of an experienced and dedicated team who strive and succeed in making every dream home a reality. 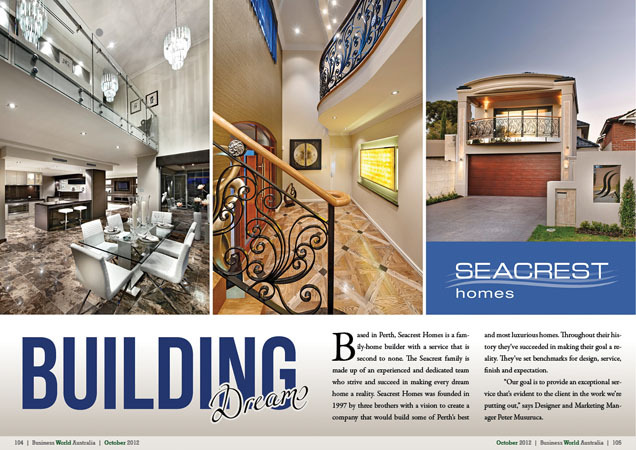 Seacrest Homes was founded in 1997 by three brothers with a vision to create a company that would build some of Perth’s best and most luxurious homes. Throughout their history they‘ve succeeded in making their goal a reality. They’ve set benchmarks for design, service, finish and expectation. “Our goal is to provide an exceptional service that’s evident to the client in the work we’re putting out,” says Designer and Marketing Manager Peter Musuruca. The company’s approach to client service is as exceptional as their designs. They take extraordinary care of their customers, going out of their way to satisfy everyone from start to finish. To ensure that standard of service is met, Musuruca involves himself very closely in all of the company’s projects. He makes sure that the company discusses all project details with their customers to ensure expectations are fully met. At Seacrest Homes, they employ approximately 12 staff members. According to Musuruca, the company has the same approach to the employee-company relationship as they do to the relationship with their clients – they take care of them as much as possible. In return, everyone in the Seacrest organisation works as a cohesive unit to deliver unparalleled service and quality for the clients. Seacrest Homes currently has a dozen projects underway, which is par for the course as far as their average output is concerned. Anywhere from 12 to 24 homes are being worked on at one time, depending on the amount of inquiries they receive from interested buyers. Currently, they average around 15 homes a year. Looking ahead longer term, the organisation wants to remain well-known in the exclusive home market and continue building high quality homes for clients. They do want to grow, but only to an extent where they can handle the jobs. “We’ve got a fine balance at the moment where we can handle everything,” he says. “We try to give people a dream home to exceed their expectations, and that’s what we’re doing.